Here is the autobiographical account of the spiritual journey Augustine made as he wrestled with his own passions, his conscience, and the God who sought to give him rest. Limited-time offer: only $1.00! Enter code coa2006 for $3.95 off on price! "My soul is restless, and it will never be at rest until in finds rest in Thee." In a candid autobiography, Augustine, one of the greatest Christian thinkers of all time, takes us along on his spiritual odyssey as he rebels against the longings of his Christian mother, gives in to his passions, grapples with his growing ambition and intellectual prowess, and, coming full circle, finds in his mother's God the peace and purpose he had always been seeking. 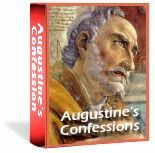 Augustine's Confessions is a wonderful resource for spiritual growth and personal reflection to discern what is trivial and what is ultimately important. Limited-time offer: only $1.00! Enter code coa2006 for $3.95 off on price!